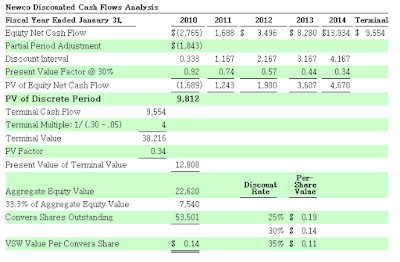 Alex Bossert's Thoughts on Value Investing: Convera Corp.
Convera is a liquidation play. Convera is trading for $.22 and the company estimates investors will receive $.26 per share in cash in the next 12 months and an additional $.11- $.19 after intellectual property is sold. The trading volume on Convera shares is small with around 150,000 shares traded a day. The first cash distribution will take place shortly after the certificate of dissolution is filled with the state of Delaware. The liquidating distributions consist of two parts. First, Convera will distribute a cash component worth $.26 per share. Second, after the certificate of dissolution is filled, Convera will merge its remaining intellectual property with VSW recieving a 33% ownership stake in VSW. Convera will sell its 33% interest in VSW or distribute it to shareholders. The company says the value of its ownership interest in VSW will be $.11 - $.19 per share. “Following the filing of our Certificate of Dissolution, we expect to consummate the merger of B2BNetSearch, Inc. and Convera Technologies, LLC, each a wholly-owned Delaware subsidiary of Convera, with VSW 2, Inc., the Delaware parent company of Firstlight Online Limited, a company in the business of online advertising sales and marketing incorporated as a company limited by shares in the United Kingdom (“Firstlight”), pursuant to, and subject to the terms and conditions of, an Agreement and Plan of Merger dated May 29, 2009, as amended and restated on September 22, 2009 (the “Merger Agreement”). As a result of the Merger, Convera will own 33.3% of the total outstanding capital stock of Vertical Search Works, Inc., a Delaware corporation and the indirect parent company of VSW 2 (“VSW”)." “Hempstead assessed the value indication associated with a one-third equity interest in VSW based upon the discounted cash flows methodology. Specifically, under a discounted cash flows methodology, the value of a company’s stock is determined by discounting to present value the expected returns that accrue to holders of such equity. Projected cash flows for VSW were based upon projected financial data prepared by our management. Estimated cash flows to equity holders were discounted to present value based upon a range of discount rates, from 25% to 35%. This range of discount rates is reflective of the required rates of return on later-stage venture capital investments." The valuation placed on the 33% interest in VSW is $.11 - $.19 per share. Convera’s estimate of the value for the cash and valuation of VSW stock to be received in liquidation are within a range of $0.37 to $0.45 per share. Herbert A. Allen has been a director of the Company since the effective date of the Combination on December 21, 2000 and was a director of Excalibur since June 2000. He has been President, Chief Executive Officer, Managing Director and a director of Allen & Company Incorporated, a privately-held investment firm, for more than the past five years. He is a member of the Board of Directors of The Coca-Cola Company. He is the father of Herbert A. Allen III. The Allen family and Allen and Co. control over 61% of the company. Since Herb Allen is friends with Warren Buffett, I’d assume he is honest and trustworthy. He is also a very well connected person, knows a lot of power players, and with his own money on the line its good that the person in control has an interest in making sure the liquidation is completed quickly and efficiently. Both Herb Allen and his son are on the board of directors of Convera. 3) another $2m 12 months after the closing plus 33% of VSW, estimated to be worth $.11- .19 per share. At a purchase price of $.22, I’m being paid an 18% return to hold a free option on the value of VSW. The value of VSW is unknown but all the upside is free. One of the major risks in a liquidation play is executives have an incentive to delay the liquidation process and continue collecting their salaries. In this case, the executives are being hired by VSW so they don’t have to worry about losing their jobs. In addition the CEO, Patrick Condo will receive $480,000 30 days after the closing of the merger. Executives, especially the CEO have an incentive to move the liquidation process along quickly. Also, Herb Allen controls over 61% of Convera and he and his son are on the board. I like the fact that he’s friends with Warren Buffett and he will insure that the liquidation process moves along quickly because $8 million of his money is on the line. The author owns shares in Convera.